The Bank are warning of imminent rises in interest rates. As Chris Giles points out, we have been here before, and before that, but that shouldn’t mean we should dismiss this talk, because one day it will happen. They (the MPC) certainly sound serious. But why when current growth is so slow are they even contemplating it? Here is a clue from Mark Carney’s latest speech (my italics). “On the supply side, the process of leaving the EU is beginning to be felt. Brexit-related uncertainties are causing some companies to delay decisions about building capacity and entering new markets. Prolonged low investment will restrain growth in the capital stock and increases in productivity. Indeed, if the MPC’s current forecast comes to pass, the level of investment in 2020 is expected to be 20% below the level which the MPC had projected just before the referendum. Net migration has also fallen by 25% since the Referendum. When people, like me, say how can the Bank be thinking of raising rates when demand is so weak, the response from the Bank would be that supply has been at least as weak. This pessimism about the supply side comes straight from the data. If I hear people talking about the UK being a ‘strong economy’, I know they either have not seen this chart or are just lying. I hear some people say this is just oil and financial services. It is not, as this table from a recent Andy Haldane speech shows. 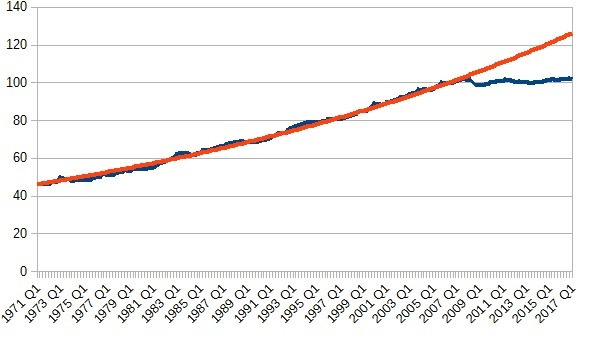 Start at the bottom: total average growth has been non-existent since the crisis. The rest of the table looks at the contribution of each sector to that total. To see what productivity growth would be excluding financial services, just add that figure to the total: 1.8% 1998-2008, 0.4% 2009-2016. That table makes it clear that the productivity crisis is economy wide. We could describe this data as five phases. 1) Productivity in the recession fell, as it often does in a recession for various reasons. 2) As the economy begins to grow again, so did productivity growth. 3) As it becomes clear, in 2011, that the ‘recovery’ is going to be very weak because of austerity, productivity growth stops growing. 4) By the end of 2013, with stronger growth under way (although still no catch up to previous trends, so not a true recovery) productivity starts growing again, although rather slowly. 5) Since the 2015 election, with the prospect and then the reality of Brexit, even that modest growth disappears. (My data does not include 2017Q2, which saw a very slight fall.) I could shorten the description as follows: recession, modest optimism, pessimism, even more modest optimism, uncertainty. The idea that the economy could get itself in a low growth expectations trap is increasingly being put forward by economists: here is George Evans, for example. The UK has got itself into that trap because on the two occasions that a recovery of sorts appeared to be under way, the economy has been hit with terrible policy errors (austerity and Brexit). But the idea that UK firms are incapable of upgrading their production techniques is nonsense. They will do so initially if they can be confident that the demand for their products will increase, or subsequently when the innovation pays for itself even though demand is flat. Which is why an increase in interest rates right now would be very bad news. It would confirm the pessimistic expectations of most firms that demand is not going to grow fast enough to make innovation worthwhile. Formally, the job of the MPC is not to worry about productivity but to control inflation. But elsewhere, where the same process may be happening to a lesser extent (the productivity slowdown is worldwide, just most acute in the UK), central banks are puzzled at why inflation just refuses to rise. The concept of an innovations gap is one solution to that puzzle. Expanding demand allows firms to invest in more productive techniques, and so there is less incentive to choke of demand by raising prices. I suspect in an alternative world where Brexit had not happened the Bank of England would also be puzzling over why prices were not rising. As a result, if the MPC do finally raise interest rates this year, it would be one more mistake to add to the growing list under the heading Brexit. On each occasion I also wrote a post saying that they should not raise rates, starting I think at the beginning of 2014. I discussed in earlier posts why real wages are falling by even more than output per head. Or perhaps the pessimism of the bank manager lending money to those firms. The Haldane speech shows that productivity growth has remained strong among the top, frontier companies. Why? Because these companies, given their position, will be seeing growth relative to the average, and have got to the frontier through a culture of innovation. It's not a nice thought, but it may be plausible. I think you are right here; the trajectory post Brexit is what I would have expected (uncertainty resulting in a reluctance to invest) sooner or later and this could be quite a significant factor. However, the implication in your piece that BAU is available is more questionable. It's not just the arguments of such as Robert Gordon re the exhaustion of technology it's also the increasing effect of demographics and the dramatic worsening in the energy availability and cost. These are issues which are not some way down the road but matters that have been influencing outcomes for years already. You are right that at the level of the individual firm there can be improvements in productivity but this does not nullify the point about the influence of secular trends on the economy as a whole. Counterbalancing these are the potential machinations of AI/robotics which do have the potential to increase productivity markedly in the coming years. As to the BOE I agree with you;putting up interest rates now is madness. To me we have a clear re run of 2011 where the bank "looked through" inflation and it did indeed come down quite quickly. I am a novice at economics so I dont understand the your explanation to "
When people, like me, say how can the Bank be thinking of raising rates when demand is so weak, the response from the Bank would be that supply has been at least as weak." Are you saying low productivity will cause inflation which will cause central bank to raise interest rates? I hope I got it right : normally you have inflation when demand is so strong that it exceeds supply. Now if demand is weak, you shouldn't get any inflation except if... supply is even weaker. And what Simon is saying is that if supply is weak that is because productivity has stalled. And that in turn is - at least partly - caused by the lack of investment as firms do not see strong demand. So that is a vicious circle. See also the link below, for example. Labour market reforms, which are supposed to increase supply, create negative pressure on wages. One consequence is that this tends to depress demand. Another is that firms tend to prefer cheap labour over adding capital to increase productivity. Why buy a new software to automate some stupid task if it doesn't cost you much to pay someone to do it manually. A theory I have come across in the financial news is that low interest rates and QE are the cause of the stunted productivity growth. They argue that cheap money has kept unproductive companies in business and prevented the reallocation of those employees to more productive jobs. That would make continued low interest rates a problem not a solution. As a lay person I see some sense in this but does it have any actual merit? Internationally, there does seem to be a long-term slowing of productivity growth - if you plot labour productivity across the whole G7, for example, you see rather a smooth tailing off from nearly 3% rate of growth in the 70's to about 1.2% pa now. Technological innovation in the 80's and 90's was driven by computing power. 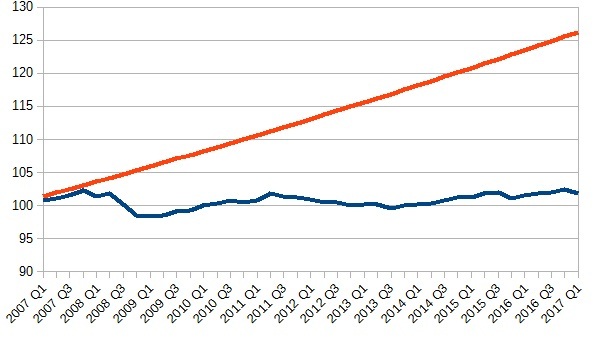 It's an underappreciated fact that the exponential increases in computer power we saw in that period significantly slowed down, quite abruptly, around 2004 (the exponential increases up to that point had been driven by the combination of the well-known Moore's law and the less-well-known Dennard scaling; Moore's law continued after 2004 but Dennard scaling ended). I don't think I've ever seen any comment from an economist about what economic effects this break might have had. In the UK, uniquely amongst both developed countries and rising East Asian states, we've seen a long term decline in R&D intensity since the 80's, from more than 2% in the early 80's to a low point of 1.55% in 2004. We know that the links between productivity, technological innovation and R&D aren't completely straightforward, and that the effect of changes in R&D intensity on productivity outcomes must surely be significantly lagged; but perhaps we shouldn't be surprised if a change in the innovation landscape of the country had some sort of effect on productivity. What you say about the slowdown in the increase of computing power makes sense but... since that time there has been a vast expansion of the use of internet including wireless internet and smartphones. Look also at the number of people using laptops everywhere. I hardly see how that would not have brought huge productivity gains in many different areas. That makes the puzzle even more puzzling. 1. Although we can hope that productivity growth in other parts of the economy will resume, given good policy, this isn't the case for oil and financial services. The oil has gone, we've used it up and it's not coming back, while reduced productivity in the financial services is inevitable and indeed desirable given the need for stronger regulation. So in order to get back to pre-crisis rates of productivity growth, the other parts of the economy haven't just got to recover to their previous productivity growth rates, they have to grow faster to compensate for the loss of oil and financial services as drivers of productivity growth. 2. The kind of TFP decomposition that strips out the effect of these two sectors focuses only on direct contributions, not their indirect effects. You could plausibly argue that the importance of oil and financial services suppressed the potential for productivity growth in other sectors, by keeping the pound high and crowding out investment and human capital in those other sectors - Dutch disease, in other words. A Labour run on Sterling? Could independent central banks be advisory?